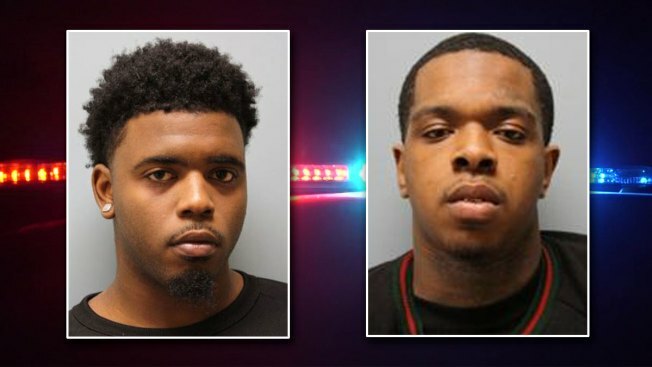 Eric Black Jr., left, and Larry D. Woodruffe, right, have been charged with capital murder in the shooting death of 7-year-old Jazmine Barnes. A second man is behind bars, charged with capital murder in the shooting death of 7-year-old Houston girl Jazmine Barnes, according to the Harris County Sheriff's Department. Barnes was killed in a drive-by shooting Dec. 30, 2018, that investigators now believe to be a case of mistaken identity. Over the weekend investigators identified and arrested 20-year-old Eric Black Jr., and charged him with capital murder. Black, who appeared in court Monday, admitted to taking part in the shooting but said he was behind the wheel and not the one who pulled the trigger. On Tuesday, investigators said they'd filed another capital murder charge in the case — this one against 24-year-old Larry D. Woodruffe. Officials said both Woodruffe and Black were taken into custody Jan. 5 and that they were charged with capital murder after obtaining corroborating evidence. Woodruffe, officials said, was being held on a felony drug possession charge prior to being charged with capital murder. A prosecutor on Monday said Black and Woodruffe mistakenly thought they were attacking people whom they had fought with at a club hours earlier. The case was initially believed to possibly be a hate crime after one of Washington's daughters, who are black, thought she saw a white man in a red truck leaving the scene of the shooting. Both suspects, Black and Woodruffe, are black. Gonzalez said there was, in fact, a red pickup truck driven by a white man seen at a stoplight just before the shooting, but the driver didn't appear to have been involved. The sheriff said it was dark, the shooting happened quickly, and the red truck was probably the last thing seen by Jazmine's family. The second capital murder charge comes on the same day family, friends and community members said goodbye to Barnes -- described as a loving and caring girl who was "very smart in school," according to her father Christopher Cevilla. The girl's funeral was paid for with donations from Shaquille O'Neal and a Houston police officer.